Level 3 * From one of America’s well-known organ composers, we proudly present a remarkable volume of skillful and stylish service music, all designed for those special seasons of the year not usually represented in most other collections. Worship services representing Christ the King (Meditation on “Darwall’s 148th”), Reformation (Built on a Rock; Organ Variations on “Foundation”), Thanksgiving (Thanksgiving Prayer; Festival Prelude on “Old 113th;” Harvest Home) and many other special musical moments, various opening festivities, and beginning-of-the-church-year occasions. 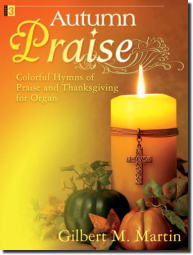 A delightful cornucopia of glorious, joyous sound for the organist—and for the worshipping congregation.